It's never too early to contemplate safety measures for your Fourth of July celebration. Doing so will assure that you and your loved ones have a great time on Independence Day. There's nothing patriotic about suffering injuries and having to go to the emergency room when everyone else is celebrating. First and foremost, obey local laws. If fireworks are illegal where you live, don't use them. Even if they are legal in your area, keep fireworks out of the hands of minors, including unlit fireworks. Take children to public firework displays and seize the opportunity to discuss safety issues beforehand. Follow the directions on all fireworks and don't use them for anything other than what they're intended for. Don't attempt to alter or combine fireworks products. Report illegal explosives to the nearest fire or police department. When lighting fireworks, always have water handy. A hose is best, but a bucket will suffice. Spectators should remain a safe distance from the fireworks being lit. Whoever lights the fireworks must be sober, wear safety glasses, and keep clothing well away from the flame when lighting. Only light fireworks outdoors on a smooth, flat surface, away from all flammable materials including dry leaves and paper. Never try to relight fireworks that appear to be duds. Wait up to 20 minutes for a possible delayed ignition. Then if nothing happens, soak the firework in a bucket of water and dispose of it. Dispose of all firework materials by first soaking them in water before putting them in the trash. Keep sparklers away from clothing and other flammable materials. Most animals are frightened by fireworks. Pets that feel scared may react by running away from home, defecating indoors, or otherwise destroying property. Protect your pets on the fourth of July by taking some basic precautions. Don't take your pets to fireworks displays. Don't leave your pets in a car by themselves. Don't leave your pets unattended outside. 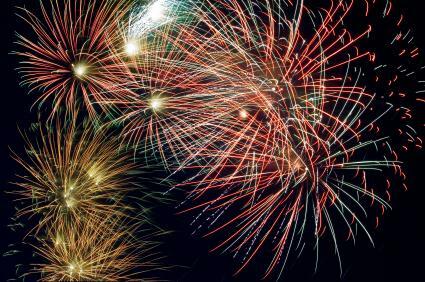 During public fireworks displays, keep your pets in a safe place indoors where they won't be able to destroy anything. If your home isn't soundproof, you might want to leave the television or radio on so your pets won't hear the fireworks. Consult your veterinarian ahead of the holiday if your pets have a tendency to overreact to loud noises. Fireworks are usually the first thing most people think of when it comes to the Fourth of July, but there are other aspects to the holiday that merit precautions. Most summer season safety measures are worth bearing in mind on Independence Day. Depending on which specific activities comprise your festivities, the following are possible concerns. During daylight hours, you'll want to protect yourself from excess exposure to the sun. Wear sunscreen and a hat. Heatstroke and dehydration are other daylight concerns to keep in mind. Be sure to drink plenty of water and seek out shady areas if you feel overheated. If you host or attend a barbecue, beware of possible fire hazards and outdoor food spoilage. Depending on your location, you may need to wear insect repellant and be alert for bees or wasps. Use good judgment when going swimming or boating. Be alert to water conditions, such as water depth and ocean currents. Make sure novice swimmers use flotation devices and children have chaperones. Wear protective gear for bicycling and other sports. A single article about Fourth of July holiday safety tips can only scratch the surface. To learn more, visit the National Council on Firework Safety, the federal government's online guide to Independence Day, and the resources published by the American Society for the Prevention of Cruelty to Animals. Becoming knowledgeable about safety measures will help make the holiday more fun for everyone involved.